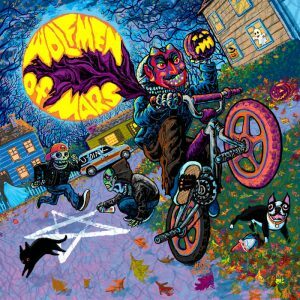 Just in time for the Halloween season, Wolfmen of Mars drop a new E.P. Warped Suburbium. And let me tell you, this instrumental sonic blast of 6 songs is garunteed to put you in a spooky mood. This outing for the Wolfmen of Mars feels like Halloween to me. Songs like these could be a score to your favorite creepy horror film. And that’s not to say the music sounds like generic movie scores, because it is anything but. There are unique sounds being explored here.Wolfmen are the masters of instrumental horror psyche music. Imagine John Carpenter with a few more interesting ideas thrown in. Over the past few years, WMOM have been building their fanbase and reputation with a steady stream of unique and consistantly awesome releases. Warped Suburbium is definetly a testament to that fact and is quickly becoming my favorite outing by them.